A quick disclaimer: BidmeadBites has not ceased to eat or exist, although I’m aware the increasing length of time in between each post gives that impression. I’ve clearly been far too busy eating and cooking to actually write about it, but I correct that here with a new post on a recent trip to Granada. Home to the almighty Alhambra palace and Spain’s Moorish past, Granada is also at the very heart of the great Spanish tradition of tapas. Renowned for its plentiful portions which come complimentary with each drink, Granada outshines any other Spanish city in the tapas stakes. Complimentary…what, like, don’t have to pay for it? That’s correct. As someone who loves to bag a bargain, finding good food on the cheap is a real hobby of mine. Do you know what’s better than cheap? Completely free food. Los diamantes, founded in 1942, is a cornerstone in the tapas scene of Granada, with three branches in the city centre. As you wiggle your way through the crowds and wade through the used napkins strewn around the floor, you place your drinks order and wait. Fight the urge to look at the menu, and don’t you dare even think about ordering food. The whole fun here is seeing what food your drink will bring – a fresh plate of beautiful tomatoes, coated in olive oil and sprinkled with chunky salt maybe? Or some freshly cooked prawns, practically still swimming on your plate with head, tail and eyes intact? Once you’ve had a couple of drinks and reveled in the sheer thrill of free, random but most importantly tasty plates, you are then welcome (and encouraged) to look at a menu. Doing so, the offal lover in me rejoiced. Morcilla (the very best kind of black pudding), mollejas (sweetbreads…just good old glands) and sesos (these, my friends, are brains) jumped out at me. Black sausage was just a bit boring, while brains were slightly too hannibal-esque. The sweetbreads suited me perfectly. Ordering an enormous plate that claimed to be half a portion, I dug into these rich, creamy and smoky grilled glands. While I’m an outright offal lover, my pescatarian sister is (quite obviously) not. 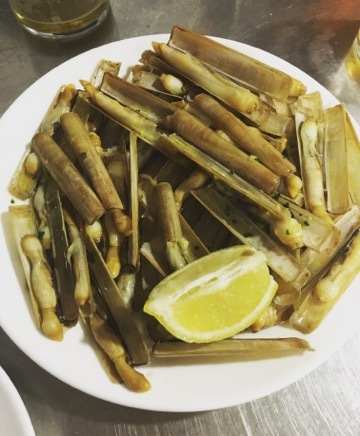 In order to balance of the vast quantity of animal glands on the table, we also ordered a plate of navajas – razor clams, soaked in a buttery garlic and parsley sauce. These were a happy memory of ours from family holidays to the Costa del Sol, and Granada’s version did not disappoint. Another highly recommend tapas spot is La Taña. Owned by a sommelier, this small bar’s walls are adorned with hundreds of bottles of wine. 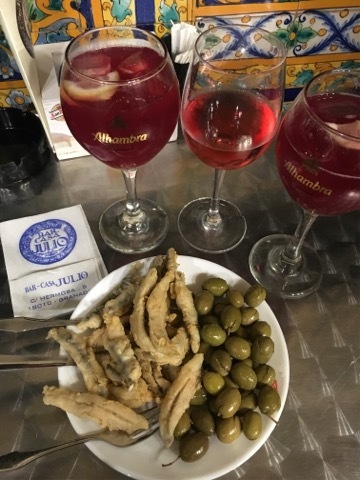 We enjoyed a couple of glasses of red and sampled their homemade vermouth, which although sweeter than I’m used to, was just the thing to go with the little montaditos (slices of french bread with savory toppings) that came out with each drink. 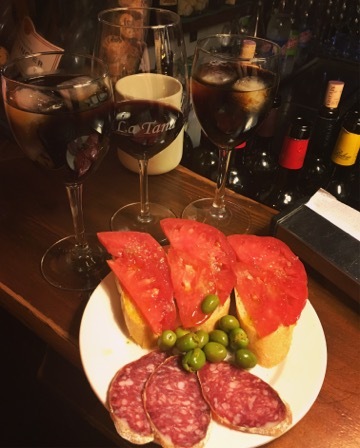 I highly recommend La Taña for a taste of tapas culture and great wine – a lot of tapas is based on drinking cañas (small beers, a little less than a half pint), but for when you don’t fancy beer this wine bar makes a great alternative. Beer, wine, vermouth…what about something distinctly summery, almost so sweet it verges into the realms of alchopops? Have a tinto de verano with your tapas! This fine concoction of red wine and lemonade is just the tipple to kick off a long night of food and drink. When you order your tinto, you’ll be asked “con blanca o de limón?”. Blanca is a natural, less sweet soda, while limón refers to something more like a lemon Fanta. Go for blanca and enjoy the smoothness of this chilled beverage without a sugar overload. We enjoyed many a tinto and a free tapas with it at Bar Casa Julio, another iconic city centre bar. Here the tapas were plentiful and filling, and my favorite was this plate of boquerones, little fried anchovy-like fish. Ordering off the menu, we opted to try berenjena frita con miel de caña (deep-fried pieces of aubergine drizzled with thick and dark sugar cane molasses). 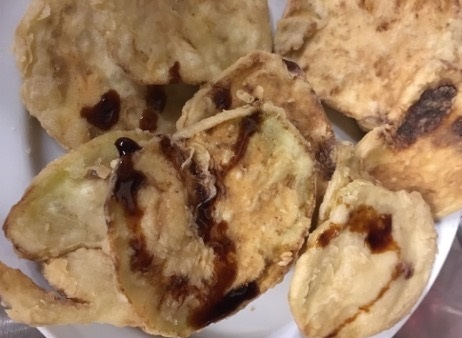 An Andalusian specialty, the contrast of the full-bodied sweetest of the molasses against the savory fried aubergine is at first an unexpected combination of flavors, but by the second slice you’re hooked. 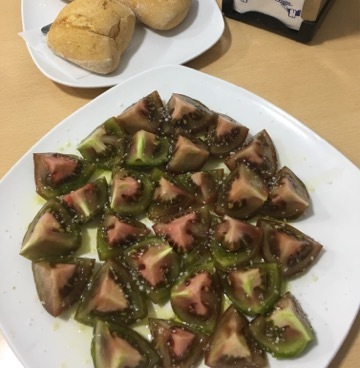 Despite the fact you could quite easily spend your entire time in Granada eating like King Felipe himself without placing any food orders whatsoever, it is worth veering away from the free tapas on occasion: such as when visiting Bodegas Castañeda. Deciding what to order here was difficult, and not just because we’d become so quickly accustomed to free food rolling out after us; everything on this menu tempts. From mixed cold plates consisting of various montaditos, or hot fried fish platters, it all sounded wonderful. 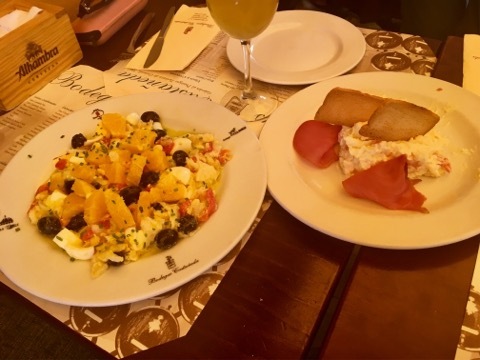 After much deliberation, we went for a retro classic and Bidmead family favorite – ensalada rusa, which wins awards for the least salad like salad around: potatoes, eggs, and more mayo than you can shake a stick at. Along with this we went for the house special, a cold plate with an odd-sounding but great tasting mix of oranges, salted cod, olives, tomatoes and capers. Other than this there was some refreshing gazpacho and a tuna empanada (Spanish-style pasty). Together it was a perfect pre-Alhambra lunch, giving us all the fuerza we needed to conquer the castle. Leaving Granada, my only real regret was not having visited sooner. 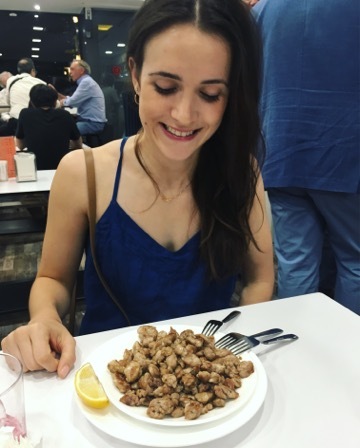 To think I’ve lived 25 years and spent various holidays in Spain, without making it to this magical city, where food is not only delicious but completely free…oh what a fool! But now I share this knowledge with you all in the hope you don’t waste any more time going any where else. Granada, I’ll be seeing you very soon.